Ayelet and Avigdor both lost their parents in terror attacks. Last night, they got engaged after meeting at a support group for orphans. Ayelet Dikstein and Avigdor Gvish who had both lost their parents in terror attacks almost 20 years ago are engaged. The two met at a support group for orphans. Sunday morning, Amihai Itali for Yediot Aharonot reported on the engagement ceremony that took place on Saturday. The happy occasion was marred by the fact that their parents could not be there, having been murdered. For Avigdor’s family, terror struck in 2002, during the Second Intifada, when he was just a 19-year-old soldier. It was at the end of the Pesach Seder, a day after the horrific massacre at the Park Hotel in Netanya. A Palestinian terrorist infiltrated the family home in the Samarian community of Elon Moreh. The terrorist opened fire on the family, critically wounding his father, David, who later died of his wounds. Also murdered were Avigdor’s mother, Rachel, and her father Yitzchak Kanar who joined the family for the seder. His brother Avraham, who was serving as a Major in the elite Sayeret Matkal unit was shot as well. The injured Avraham asked Avigdor to bring him his weapon that was upstairs. Having just drafted, Avigdor did not yet know how to shoot, but did as he was asked. Avraham’s condition worsened and he found it difficult operate the weapon. He later died of his wounds. The terrorist was killed by IDF forces. Four months later, terror struck Ayelet’s family. At the end of July 2002, the Dikstein family were driving from their family home in Psagot to visit family in Yeshiv Ma’on, in the Hevron Hills. Their car was fired on by terrorists. Ayelet’s little brother, Shoval, was hit, as well as their mother, Chana. Her father, Yosef, stopped the car to try and help his wife and young son, but was shot to death. The mother and young son later died of their wounds. Ayelet, a young girl at the time, resourcefully helped her other brothers in the car as they were under attack. Over the years, Ayelet and Avigdor would meet at support groups for orphans run by One Family. There they found that they had a lot in common. As time went by the bond between them grew, and they started dating two years ago. 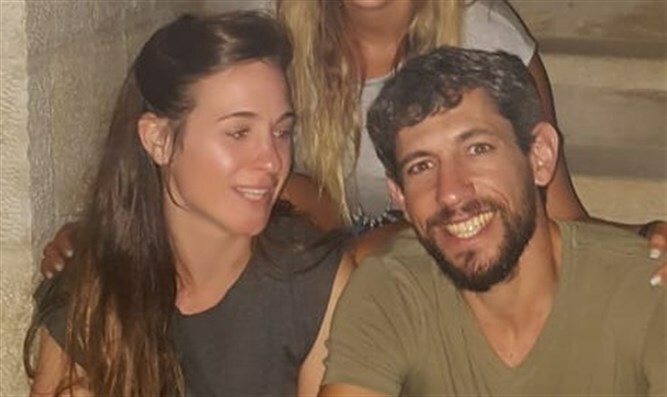 On Friday, before they announced their engagement, the couple went to Elon Moreh cemetery to visit Avigdor’s parents David and Rachel, his grandfather, Yitzchak Kanar, and his older brother Avraham that were murdered in the attack. From their they went to the Psagot cemetery to visit Ayelet’s parents, Yosef and Chana and her young brother Shoval that were murdered. Only afterwards, did the couple announce their decision to marry to the rest of the families and friends. The couple celebrated their engagement in Elkana, at the home of Avigdor’s brother. There was a lot of excitement and happiness, but also sadness and pain that the murdered family members will not be at their wedding.